Posted on April 14, 2016 by Philip O'Hanlon. AXPONA is this weekend in Chicago (April 14th – 17th). We have a relatively short equipment list, but it’s heavy on new products. Visit AXPONA event page to learn more. 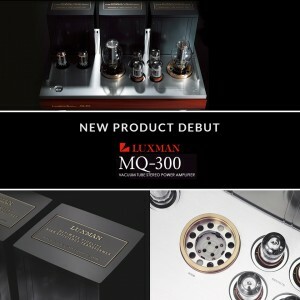 The Luxman EQ-500 phonostage is the best looking, best built, and best sounding phonostage that Luxman has ever made. A vacuum tube design is utilized in order to deliver the tonal density that the best vinyl playback is capable of. The EQ-500 also uses only the highest quality parts: Mundorf “audiophile” series capacitors (Germany), JJ vacuum tubes (Slovakia) and Takamisawa capacitors (Japan). This entry was posted in Latest News and tagged Axpona, da-250, EQ-500, Exoteryc, Luxman, MERGING+NADAC, mq-300, New Products.